Oatmeal is a great way to start your day. Having a bowl of hot porridge everyday can get really boring. Adding oatmeal to smoothies is a another way to enjoy this highly nutritious grain. You can add cooked oatmeal for a creamy smoothie or raw oatmeal if you like little crunch. If using cooked oatmeal in your morning smoothie, it's best to pre-cook the oatmeal the night before, to allow to cool completely. Usually I make oatmeal breakfast smoothie with some fruits like this strawberry banana oatmeal smoothie. So this time I thought to try something different and made this chocolate smoothie with oats, banana, almonds and dates. I added a little drinking chocolate to make it extra delicious. The sweetness from the banana, dates and drinking chocolate was perfect and I didn't have to add any extra sweeteners. Even kids would love this healthy smoothie, so do try and let me know how you like it. 1. In a blender add oats, almonds and grind it to a fine powder. Now add banana, dates, ½ cup milk and blend until smooth. 2. Add remaining milk, cocoa powder, drinking chocolate powder, vanilla extract and blend until smooth. Pour into glass and serve immediately. 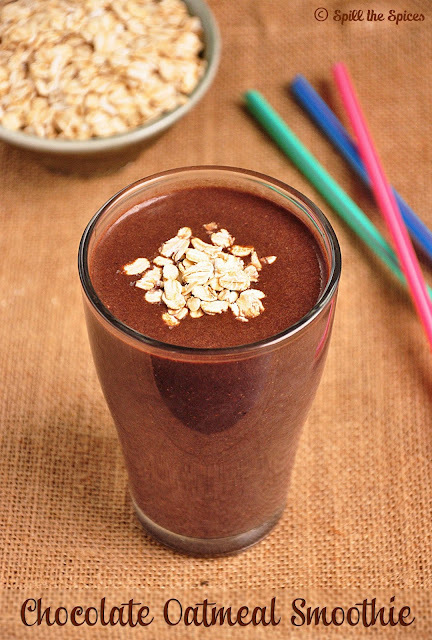 If you prefer cooked oatmeal in smoothies, cook it previous night to allow to cool completely. Instead of drinking chocolate, you can also add any chocolate malt powder. To spice up the smoothie, you can add a pinch of cinnamon. You can add honey or natural sweeteners if you want more sweetness. I could happily start my day with such a yummy chocolatey and healthy smoothie..
Must be a filling smoothie.With all the good things going in ,love to gulp a whole glass. 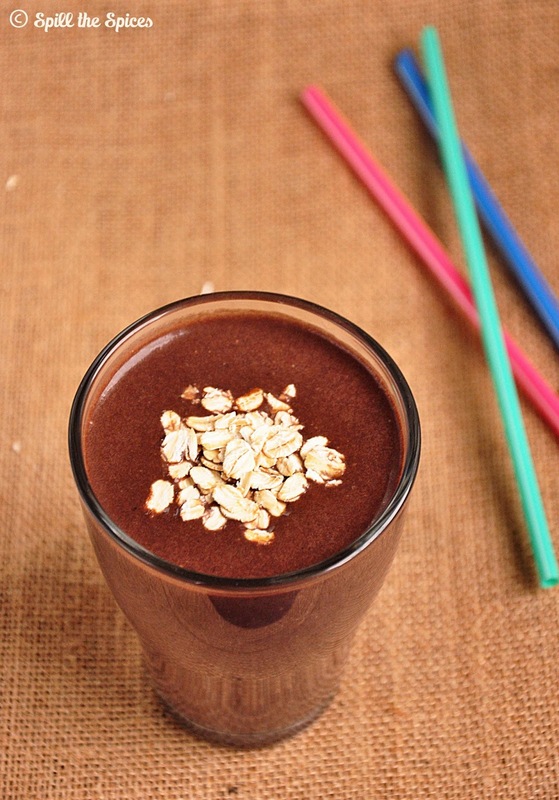 Who can resist this oatmeal smoothie with chocolate in it. Sounds a delicious and healthy smoothie. Delicious chocolate oatmeal smoothie really yumm. yummy and filling smoothie!! Lovely color!! Delicious, healthy and filling breakfast smoothie.. 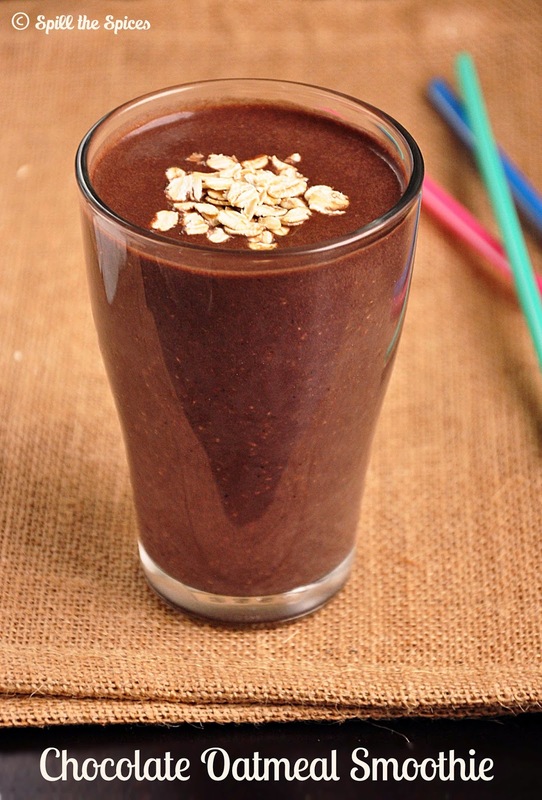 Innovative oats smoothie recipe dear.. Looks delicious and inviting. Nice pics too. Hi sona, this is a very good idea of oatmeal smoothie with chocolate,visiting first time. Perfect and healthy one ..